A Leamington man has finally admitted being responsible for carrying out gunpoint robberies at a Warwick petrol station and a village store on the same night. 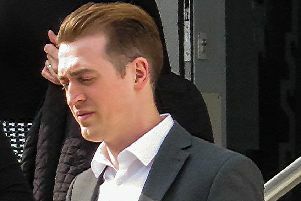 Michael Hackett had pleaded not guilty at Warwick Crown Court to two charges of robbery and two of possessing an imitation firearm at the time of committing the offences in June last year. The raids, for which get-away driver Samuel Gold was convicted after a trial in July last year, took place at a BP service station in Warwick and the Co-op store in Long Itchington. And at a pre-trial hearing Hackett (30) of Fallow Hill, Sydenham, Leamington, changed his pleas to guilty. At the request of his barrister Adam Western, his case was adjourned for a pre-sentence report to be prepared on him, and he was remanded in custody. He and Gold (31) of Freshwater Grove, Leamington, who has also been remanded in custody, will be sentenced at Wolverhampton Crown Court, where the judge who heard Gold’s trial now sits. During Gold’s trial prosecutor Simon Foster said that a CCTV camera at the BP garage in Stratford Road, Warwick, showed a white VW Golf pull onto the forecourt at 8.20pm on Sunday January 15 last year. Gold bought something, returned to the car, and drove off before going round the block and returning to Stratford Road. He then backed onto a grassed area which runs along the side and rear of the filling station. Gold remained in the car while his passenger, dressed in black and with his hoodie concealing his face, went into the shop brandishing a gun in his right hand. Not satisfied with the amount of cash he was given, he demanded cigarettes, then left with just over £200 in cash and the cigarettes, and returned to the Golf which drove off at speed. “Jump, but not very long, to seven minutes past nine, and to the Co-op store in Long Itchington, which is about 12-and-a-half miles away, which you can do in the time. “Again there is CCTV in that store, and enter the same man, wearing a balaclava. “He still had the gun, and he pointed it at the two frightened assistants and said ‘I want the money.’ He ordered them to go to the till and asks for the money to be put in a bag. “He again came across as almost apologetic, saying ‘I don’t want to do this.’ But he was pointing a gun, and once again he left with cash, about £400,” said Mr Foster. When the police saw the CCTV recording they could make out the registration number of the Golf and spoke to its owner who revealed that he had lent it to Gold, who was then arrested. During the trial Gold accepted he had been the driver, but said his passenger, who he did not name, had asked to be taken to the petrol station and to the store, and claimed he did not know what he was doing, or that the gun was under his bed. But Mr Foster said: “The Crown say he participated in the offences, even if he was not the one who thrust the gun into the shopkeepers’ faces. After the jury had returned its verdicts, Gold was remanded in custody for a pre-sentence report to be prepared on him to consider whether he poses a danger to the public. But before he was due to be sentenced, Hackett was arrested and charged – so Gold’s case was then adjourned so they could both be dealt with together.